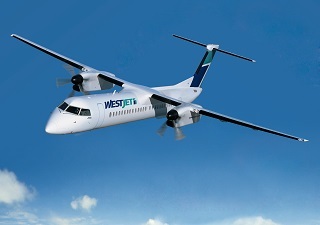 TORONTO, 2015-6-17 — /Travel PR News/ — Bombardier Commercial Aircraft announced today that Calgary-based WestJet Encore Ltd. has signed a firm order for five Q400 aircraft. The airline also signed a firm order for one Q400 aircraft in March 2015. These transactions are conversions of options previously booked by the carrier’s parent company WestJet Airlines. Thanks to its combi­nation of turboprop attributes, jet-like features, industry-leading passenger experience and environmental footprint, the Q400 aircraft is exceptionally versatile and can be adapted to a variety of business models. By offering a 30% reduction in fuel burn over the jets it often replaces, the Q400 aircraft radically reduces carbon emissions and increases cost efficiency. Its high-speed cruise — 160 km/h faster than conventional turboprops — places the aircraft’s flight time within minutes of jet schedules, at the same seat cost as larger single-aisle jets. Its large propellers operate at a lower RPM, generating more power with less noise and making it a friendly option for city centres. This entry was posted in Airlines, Business, Transportation, Travel, Travel Management, Travel Marketing, Travel Services and tagged Bombardier Ferio Pugliese, Bombardier Q400 aircraft, WestJet Encore. Bookmark the permalink.